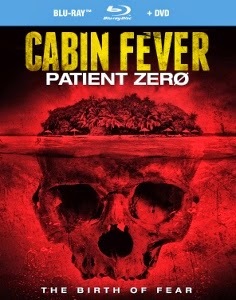 Two recent horror releases that really aren’t worth the time: Cabin Fever: Patient Zero, from Image Entertainment, and Baby Blues, a Chinese import from Well Go USA. The former is a prequel to Eli Roth’s 2002 breakthrough Cabin Fever. The latter is another in a long line of sinister doll flicks. While neither rises above the direct-to-video junk heap, Cabin Fever is easily the better of the two. It’s the third film in the franchise (the second, Cabin Fever 2: Spring Fever, was disowned by its director) and takes us back to the origin of the flesh-disintegrating infection that plagued victims in the previous films. Not that anyone really needed to know. What makes it somewhat interesting is the performance of Sean Astin. Though undeniably slumming (maybe he owed someone on the production team a favor), the former Samwise throws himself into a part that quite frankly didn’t require such effort. He plays Porter, the “patient zero” of the title. His son has died from exposure to the unknown virus, yet Porter is apparently naturally immune. He’s being held against his will, treated like a lab rat as doctors try to turn his blood into a vaccine, in a medical facility on a remote island. When a group of friends make their way to the island’s coast, the virus spreads and much gore ensures. The makeup effects are effective and flashes of gross-out humor will surely please genre fans. Almost nothing positive can be said about acclaimed Chinese-British director Po-Chih Leong’s Baby Blues. A couple, Tian Qing (Sing Kwan Janelle) and Hao (Raymond Lam), move into new house and find a sinister baby doll that cries blood tears. It was left there by the previous owners. The naïve couple is warned by a perpetually drunken neighbor (Hoi-Pang Lo) that nothing good will come of their residency. His prophecy becomes true when twin-bearing Tian Qing’s pregnancy results in one live birth and one stillbirth. Tian “replaces” the deceased child with the spooky doll. That’s when the doll’s evil powers begin to emerge. Baby Blues is not scary, tense, or even funny. From a storytelling perspective, it’s simply inept. The digital animation involving the doll would look bad in a video game. Some atrocious 3D-oriented shots (it was theatrically screened in that format) provide the most unintentionally laughable moments. And the obviously dubbed Cantonese dialogue is poorly integrated into the mix, lending a very cheap, unconvincing aura to a film that is as stillborn as Tian Qing’s unfortunate son. Both Image and Well Go USA offer strong Blu-ray presentations of these films. Neither is artfully crafted, with mostly arbitrary framings by their respective digital cinematographers. The movies may not be particularly inspired, but at least the high definition transfers aren’t difficult to look at. Each film has an entirely serviceable DTS-HD MA 5.1 surround mix. Neither Cabin Fever: Patient Zero or Baby Blues come with any supplemental features, though the former does include a standard DVD.